Shikhar Dhawan had aggregated just 152 runs in 6 innings at an average of 25.33 and strike rate of 116.03 before the clash against KKR at Eden Gardens. Although he had registered a couple of decent scores, his scoring rate was poor and amongst the lowest for an opener in IPL 12 – this had hurt Delhi in almost every game they had played in the season. His recent form in limited-overs cricket had also been a cause of worry for India – he had scored just 423 runs at an average of 26.44 in his last 17 innings (ODIs and T20Is) with just one hundred and two fifties. Delhi needed Dhawan to bring out his A-game and put in a creditable performance. And the left-hander did not disappoint! He registered his highest score in IPL (and in all T20 cricket) as his match-winning unbeaten 97 off just 63 deliveries took Delhi to a commanding seven-wicket win (with seven balls to spare) against KKR in their own backyard. It was only their second win against their more fancied opponents at The Eden Gardens. Dhawan started cautiously while Prithvi Shaw assumed the role of the aggressor as Delhi began their hunt of chasing down KKR’s 178. 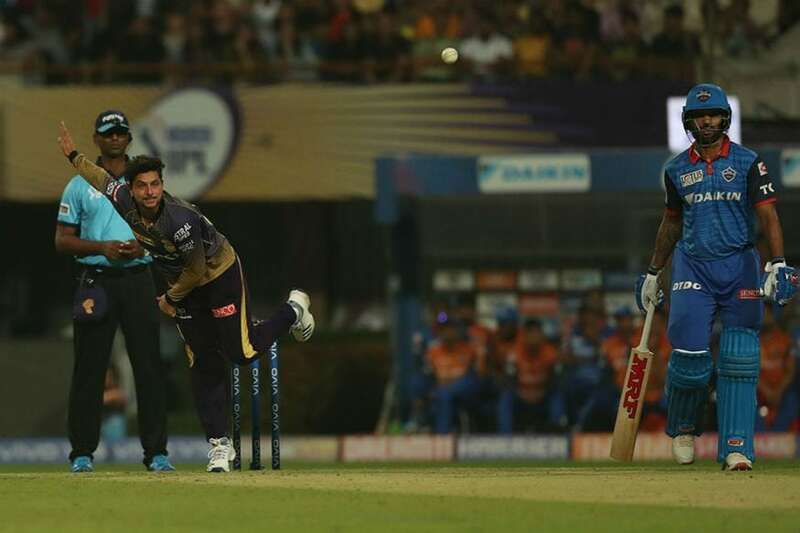 The southpaw had scored just 1 run off the first six deliveries he faced before getting stuck into Prasidh Krishna – three short deliveries – 6, 4, 6 – a six over third-man followed by two ferocious hits over point and backward-point. Dhawan meant business. He wasn’t going to mess around this time . He did not want to waste the powerplay. A lucky break in the 4th over off Andre Russell (dropped at slip by Nitish Rana) and Dhawan made the most of it by hitting the fast bowler for three boundaries in the over. Delhi had raced to 57 for 2 in the powerplay – it was their highest score in this phase of play in the tournament. 84.21% of the runs had come in boundaries which included 6 fours and 4 sixes. Dhawan had contributed 37 off just 21 deliveries and hit 5 fours and 2 sixes in the initial six overs. Although Delhi lost the wickets of Shaw and Shreyas Iyer, they had a cushion by scoring at a fast pace. The required run rate was lesser than the current run rate. It seemed to be a deliberate ploy by Dhawan to attack the bowlers early in his innings. He did not play the role of the anchor as customary but went on the offensive from the start. He realized Delhi were too cautious and circumspect at the start of the innings which was putting too much pressure on the middle order and hurting the team’s chances. Dhawan continued to milk the bowling picking the odd boundary and brought up his fifty off just 32 deliveries. He drilled Lockie Ferguson through covers for two boundaries in the 13th. Pant was scoring at a fair clip from the other end. The partnership took the game away from KKR and just 41 were needed for a win off the final 5 overs. Pant was finally dismissed for 46 off 31 deliveries but Delhi had already sealed the match. The stand added 105 for the third-wicket. Dhawan dominated the partnership – in terms of runs scored and matched Pant shot for shot with almost the same strike rate – a commendable achievement against someone of Pant’s hitting prowess! The southpaw contributed 56 off just 38 deliveries at a strike rate of 147.37 while Pant added 46 off 31 (strike rate of 148.39). Dhawan’s unbeaten 97 off just 63 deliveries included 11 fours and 2 sixes. He was in control of 87% of his shots – a very high percentage for the attacking innings he played. The cover drive was his most productive shot aiding him 18 runs. Delhi romped to victory in the 19th over with 7 wickets in hand. It was a crucial win which took Delhi to Number 4 in the points table. Dhawan has been a consistent run-getter in the IPL having aggregated more than 450 runs at an average of above 35 in the previous three editions of the IPL. He is the sixth-highest scorer in IPL history after Virat Kohli, Suresh Raina, Rohit Sharma, David Warner and Robin Uthappa. It was a timely performance by Dhawan with the World Cup scheduled to start in a little more than six weeks. Not only did he score big but also countered his strike rate problem – a big confidence booster for him and a big sigh of relief for Delhi and India.